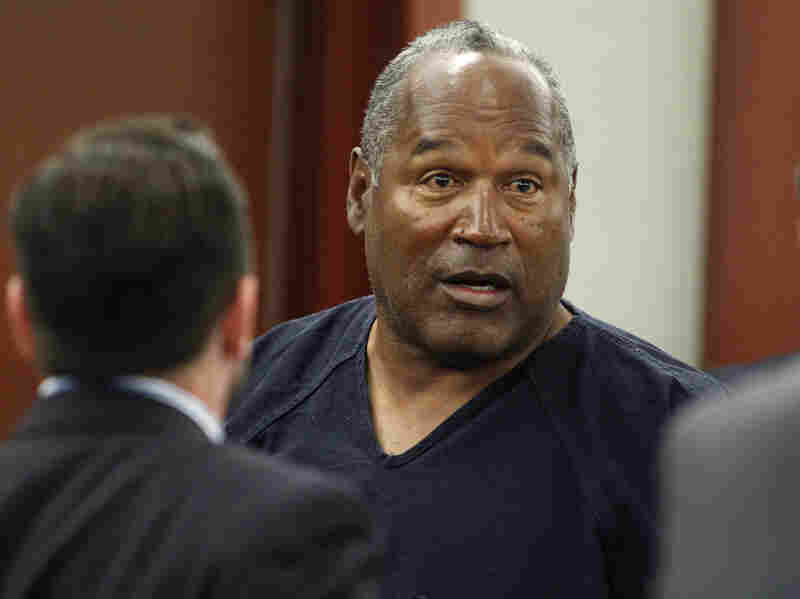 Nevada Judge Rejects New Trial For Jailed O.J. Simpson : The Two-Way The judge said the fallen football great is not entitled to a new trial for his 2008 convictions for armed robbery and kidnapping. Simpson is serving a sentence of nine to 33 years in the crimes. O.J. Simpson stands at the end of a May 17 hearing in Clark County District Court in Las Vegas. A judge on Tuesday said Simpson is not entitled to a new trial on his 2008 convictions for armed robbery and kidnapping. A Nevada judge on Tuesday denied a new trial for fallen football great O.J. Simpson in his 2008 convictions for armed robbery and kidnapping. Simpson, 66, had claimed his lawyer was incompetent and that he should be granted a new trial. But Clark County District Judge Linda Marie Bell, who heard five days of testimony in May, rejected his claim Tuesday. Simpson is serving a sentence of nine to 33 years for the crimes, which involved entering a Las Vegas hotel room with five armed cohorts to retrieve sports memorabilia that Simpson said belonged to him. He won't be eligible for parole until he is at least age 70, the Las Vegas Sun reports. Simpson won the Heisman Trophy as a college senior at the University of Southern California, went on to a Hall of Fame career as an NFL running back, and then was successful in broadcasting and acting. But he is perhaps better known for his sensational 1995 murder trial. He was acquitted in the killing of former wife Nicole Brown Simpson and Ronald Goldman. Two years later, a civil court jury ordered Simpson to pay $25 million in punitive damages and $8.5 million in compensatory damages to the families of Brown Simpson and Goldman.